Despite the continued cold spell, sport on the Old Nene at March never seems to let us down. In Sunday’s penultimate March Open match, once again there were some outstanding weights. That, I’m sure, will mean the last match of the season is going to be a cracker, perhaps seeing the biggest attendance of the whole season - such is the draw of this fine venue. Top rod in this one was Micheal Buckwalder from the Midlands. He drew the fancied pegs on the bypass section, which is renowned for big fish, and it certainly did not disappoint. At the final whistle he had taken five big tench and together with 3lb of small fish he put a winning 23lb 8oz to the scales. Danny Mason came in second from the opposite end of the match length, known as the BMX section. He found the roach willing to feed, first on bread punch fished down the middle then switching to hempseed on a long pole line, to weigh in 22lb 5oz. Best of our local rods was Sensas Mark One angler John Bates. He put 19lb 12oz to the scales, mostly roach on bread, to secure third place. In the club’s Wednesday Open match, Sensas Mark One rod John Taylor topped the field with an impressive 17lb 10oz net of roach and skimmers from peg one at Clough Bridge. Taylor fished the pole on several lines feeding a little groundbait and fishing pinkie over the top. Runner-up with 13lb 8oz was Pete Emery, who caught roach and skimmers, followed by John Young with 12lb 3oz. The next Tydd Gote AA Pike Qualifier will be held on Sunday March 1. Contact is Dave Mumby on 07749100145. 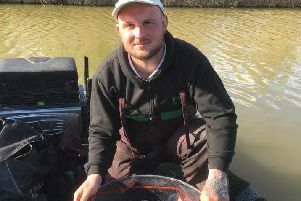 The fifth and final round of the Deeping Individual League Series was fished on the club’s match stretch of the River Welland at Deeping Roadside. Paul Dotchin took the honours with 18lb 1oz of quality roach caught on bread punch with a pole fished down the centre of the river from peg 12. That gave him the overall trophy by just half a point from David Norville. Second on the day with 9lb 6oz was Ray Torrington on peg 18 and third was Pete Molesworth Junior on peg four with 6lb 11oz. The Bevills Leam drain controlled by Whittlesey AA looks to be one of the finds of this winter as it keeps producing some very good weights despite the conditions. In Saturday’s club match it was Richard Linnell who topped the list. He had a great start bagging a tench on his first put-in and finished with 14lb 5oz. From mid-match length Jeff Tuttlebee fished the waggler for a mixed bag of small fish weighing 12lb 5oz and Frank Bevilacqua finished third with 8lb 10oz. Ringstead Grange is a popular trout fishery that opens later this month, but a few anglers have been fishing the water for pike and have been rewarded with some big fish. Pick of the recent catches was a 17lb 10oz fish caught by local rod Brett Collins. The new trout season at Ringstead starts on February 28.